Here is a bunch of easter eggs for you. Even if you watched The Darjeeling Limited you might have missed Natalie Portman who plays Jack’s ex-girlfriend. If you did you probably should watch it over. And try Hotel Chevalier which is kind of a prequel to The Darjeeling Limited with Natalie Portman and Jason Schwartzman telling more about Jack’s relationships including Portman’s character getting naked. If 21 Jump Street said nothing to you when you first heard about this movie then Johnny Depp could come as a surprise. The movie is based on the original TV series of the same name from 80’s which since has made Depp into a teen idol and helped him gather national recognition. Anne Hathaway and Channing Tatum showed up on the big screen within the debut Gordon-Levitt’s movie. They play a pretty couple in a typical love story called Special Someone. Back in 2005 all three of them already teamed up on the Havoc film set. You might have not recognized Cate Blanchett at the first sight as her eyes is the only uncovered thing. Neither did her ex-boyfriend Simon who confused her with another police investigator wearing the same forensic scientist suit. And another spoiler for you Santa Claus is Peter Jackson (not really a spoiler as you’d never find it out the other way). Watching another zombie apocalypse movie you probably don’t expect to see Bill Murray playing Bill Murray. Well, here he is. Not so long after his first Bourne movie which obviously helped him achieve huge success Matt Damon decided to appear as Donny, a leader of the punk band singing that catchy Lustra’s song in EuroTrip, a teen American-Pie-like comedy. Fortunately the police officer wearing gross mustache and massive helmet played by Edward Norton takes off his sunglasses which makes it much easier to recognize him. 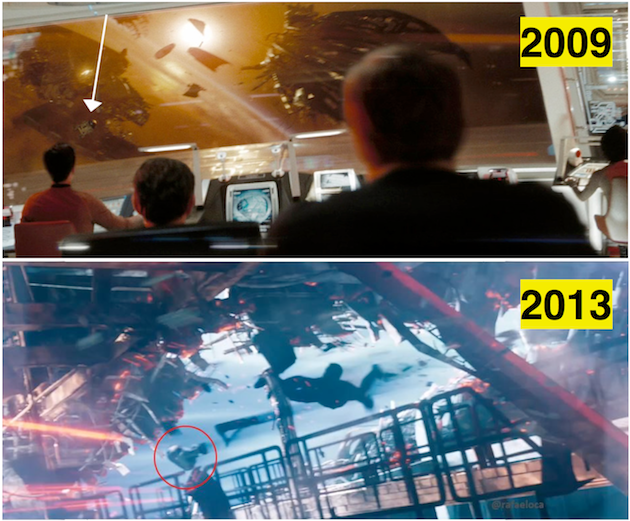 The most famous Star Wars’ droid twice in a row had a cameo in both J.J. Abrams’ Star Trek movies. You can barely see him so just accept it.